Half an hour into Doctor Strange, you are thrown along with its titular character into a bewildering abyss populated by astronomical bodies and wormholes, and dripping with neon blue and green in their kaleidoscopic glory. This visually perplexing space and time continuum not only mimics the awe-inspiring grandeur and scale of 2001's star-gate sequence but also infests it with a Daliesque eccentricity of visual imagination. As the protagonist is swept across this astral plane, he finds visual projections of his obsessions there, which makes this dreamlike space a curious crossover between an outworldly cosmos and a drug-aided journey into one's subconscious. This visual wizardry ripe with imagination and the set of rules the film lays carefully to contain its preposterous plot are what set this movie apart from other Marvel superhero outings. Marvel has never shied away from spectacular visual effects, but all the other movies arrive at an inevitable half-hour climax which actually is the same CGI explosion in another disguise (with Winter Soldier being a thankful exception). It's here that Doctor Strange comes as a welcome change, at least to an extent. 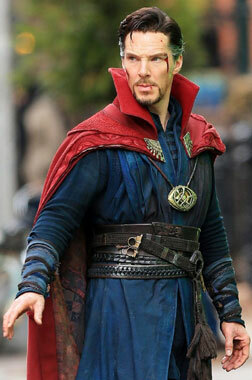 Stephen Strange (Benedict Cumberbatch) is a gifted neurosurgeon whose self-bloated ego manifests as a witty insult aimed at his admittedly inferior colleagues every minute. This wisecracking misanthropic genius draws more parallels with Tony Stark than anyone else within the Marvel-verse. 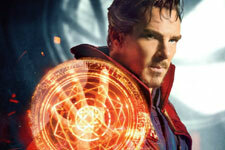 But while Stark's self-deprecating wisecracks conceal a deeply rooted guilt complex, Cumberbatch's quirky portrayal of Strange's charismatic arrogance is merely his celebration of Strange's self-sufficiency. Marvel fans will surely await a showdown between these two showmen, where they fire a quip or two against each other. Strange crashes his car into a river during an extremely careless ride (he texts while driving) and ends up with only partially functional hands that have sustained almost irreparable nerve damage. His beloved medical science rendered powerless before the situation, he travels to Kathmandu in search of an alternate treatment, where he meets this group of mystical gurus who have a secret or two to share about reality itself. Tilda Swinton plays the "The Ancient One", the sorcerer supreme who has transcended ages and sees through people, and has a solution for Strange's problem. She is aided by the submissive Mordo (Chiwetel Ejiofor) and Wong (Benedict Wong) among others. These mystic artists harness powers that tap into the very definitions of reality, and can alter it. They seamlessly hop from one dimension to another in the multi-verse, and this is where the sorcery in the plot lends itself to the film's visual sorcery taking over. Initially slow, Strange learns that he has to shred his arrogance and explosive ego to master the art that involves mantras, mystical arms drawn out of thin air, fiery tunnels that teleport across space, and cloaks with a mind of their own. The film is quite aware of its preposterousness, and hence laces the proceedings with humour at every opportune moment. It even uses its protagonist as the audience's surrogate to ridicule the plot and its elements at places. It helps that the humour is clever and is delivered with a playful glee by its actors who never forget (and never let us forget) that they are in a movie about magic and sorcery. Much of the film's action takes place in a space-shuffling reality where skyscrapers and streets shape-shift and cities realign themselves in a jiffy, creating rapidly changing labyrinths that induce an alarming level of vertigo. It's scenes like these along with the aforementioned astral journey sequence that bring a distinct visual vigour to the film. But all this is laced around a very predictable Marvel template plot that is disappointingly stale. Mads Mikkelsen's villain is the regular impractical egomaniac with unreasonable ambitions. He has a different conception of time, that doesn't sit well with a sane comprehension of reality, and he is also a former student of The Ancient One and harbours a grudge against her. Save for Mikkelsen's brilliant portray of charismatic malice, the villain has nothing interesting to say or do, and can't add any tension or gravity to the plot. And his glittering purple eyeliner is simply ridiculous. You also get to see a dark lord named Dormammu in the end who is impervious to time. But why does he have to have an ugly monster face? Does he know that he is supposed to be the bad guy? That's what he can do with all his timeless power? Can't a movie that talks of parallel universes and alternate conceptions of reality conceive a better portrayal of its antagonist? This sounds like too much scrutiny and unfair criticism to be aimed at a popcorn entertainer, but the film's visual re-imagination and narrative innovation deserved better than what it settled for. Also Rachel McAdams is criminally sidelined for most of the time, and though the chemistry has a spark, the romance is unconvincing. The post-credits scene suggests that we can expect to see Strange working together with The Avengers. It would be interesting to see how this world of sorcery merges with the relatively plain one there. I found this to be a 1-time-watch. Everybody’s acted well and the movie is visually stunning. But the plot is bland and predictable and for most part the movie is quite slow; oscillating between boredom and excitement. You’re not entirely convinced why the villains want to do what they do. In Batman Begins they made it very clear that it took Bruce years to gain the skills and tactics to don the Batsuit but here this part is shown very vaguely. It looked like Strange mastered the arts of sorcery all too soon. With all the rave reviews and word-of-mouth going on this fell slightly below my expectations. Too many parallels with Iron Man I felt and Dormammu reminded me a lot of Parallax from the green pile of garbage called Green Lantern. I strongly disagree with the bit abt Dormammu. This is a Marvel Studio production, a comic book movie. Every character in these films are based off of the characters and storylines from comics. There is a specific way Dormammu is depicted in the comics and that is what the real comic fans expect to see. Reasonable argument. I liked the way Bane and his mask are adapted to the neo-realistic world Nolan created, though it is too far from the monstrous giant the comics depict him as. (or may be because I witnessed what a mess it would be to import him the same way, thanks to Joel Schumacher). So I thought it is not completely unreasonable to expect comic book movies to distance themselves a bit from their source material and take a little risk, to sound more contemporary. The deluge of superhero movies is coming from America hence the demand for their banning in america by an american for the good of america and rest of the world. As far as India is concerned, we should expel all schmucks like you, who do know what they are talking about and yet give themselves the right to advise others, to make it better. Watch it for the visual effects....he story os so boring its a drag after the first 30 minutes. If you get to watch the trailer on a big screen where the buildings transform in a dimensions you just wait for this to be on tv. Good start great special effects but ttaoersoff to a boring yawn inducing variety after the first 45 min. fullhyd.com has 700,000+ monthly visits. Tell Hyderabad what you feel about Doctor Strange (3D)!